Bright lights, Screeching tyres and fuel vapour. 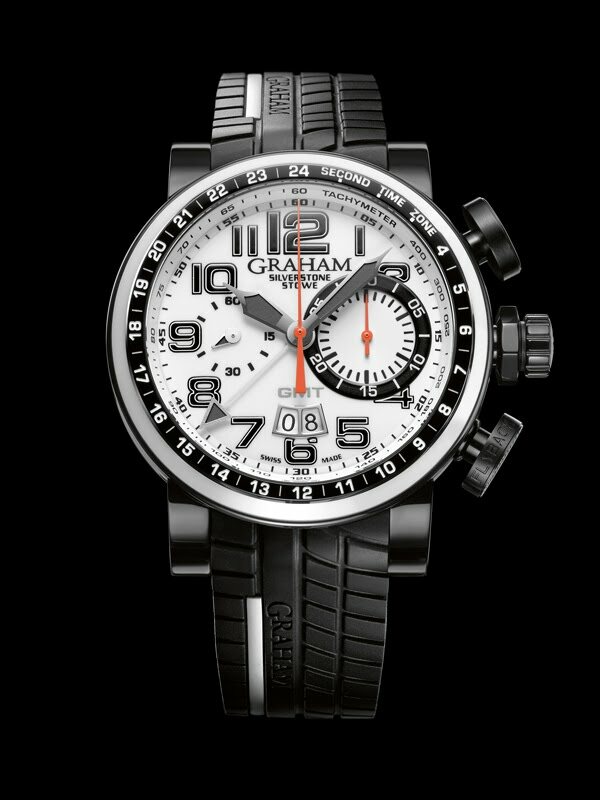 The colourful GRAHAM high-powered Silverstone chronograph is still at full speed and ahead of the race. So far undefeated, the unstoppable Silverstone Stowe GMT is winning all the races it competes in. With improved mechanics and impeccable racing features, the chronograph’s performance is undeniable. This no-nonsense watch distinguishes itself by its sporty carbon fibre dial base, enhanced by dashing colours, (blue and yellow, black and white), and an impressive array of racing skills. In addition to showing the hours, minutes and seconds, it sports 30-minute and 60-second chronograph counters, a tachymeter scale - useful for calculating speed over a given distance - a twin date aperture, as well as a GMT display indicated by an outer blue or black ring and a dedicated bold hand. Driven by the ultra-reliable GRAHAM bi-compax chronograph movement, with a 48-hour power reserve, this is a watch that can definitely take the heat and knows all about endurance. Teamed with an integrated black tyre tread rubber strap, featuring an attractive yellow or white inset, that confirms its undeniable connection with the world of motor sports, the Silverstone Stowe GMT is definitely on the fast track to successful performances. Undoubtedly on path to finish on the podium. 48 mm steel case, calibre G1721, automatic bi-compax chronograph, flyback, 28 jewels, 28’800 A/h (4Hz), Incabloc shock absorber, 48 hours power reserve, domed sapphire crystal with antireflective coating on both faces, see-through or smoked sapphire case back with limited edition serial number, integrated black tyre tread rubber strap, featuring an attractive yellow or white inset.